A friend recently gave me a package of this Baking & Pancake Mix, telling me that I just had to try it. Now, I love friends who give me pancake mixes, but whether or not I love their favorite pancake mixes... let's see. Pamela's Baking & Pancake Mix is an all-natural, wheat-free and gluten-free product. 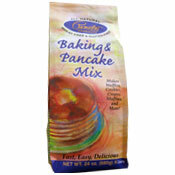 In addition to pancakes, the package offers recipes to use this mix to make waffles, cookies, crepes and muffins. This review deals specifically with pancakes. The text on the package I was most interested in was "Fast, Easy, Delicious", so that's what I used as my criteria. Was it fast? Yes. I was able to make two three-stack servings of pancakes within 10 minutes. With a large griddle, that time could have been reduced to 5 minutes. Was it easy? Yes. The instructions for these pancakes are simple. Add one egg, some water and some oil. The cooking method was the same as for any basic American pancake. I was impressed with how evenly the pancakes browned. 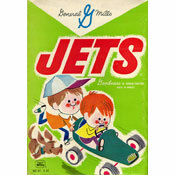 Were they delicious? Yes. In this instance, they were particularly delicious because mine were topped with maple syrup and a banana date compote. If you're using this mix to make pancakes with only maple syrup as a topping, I would recommend adding a couple drops of vanilla to the batter to bump up the flavor a bit. The true test of a product that says it's free of something, such as this wheat-free and gluten-free product, is whether or not you miss the thing that's missing. As Aerosmith would say, "Cause I'd miss you baby, and I don't wanna to miss a thing." I'm happy to report that I didn't miss anything. This mix is just as good, if not better, than similar mixes with wheat and gluten. 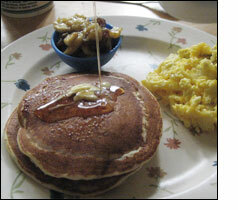 In the end, Pamela's Baking & Pancake Mix made evenly-browned, tender, fluffy pancakes with a great basic flavor. I'd recommend trying this product and I'd strongly recommend it to anyone who has to avoid gluten as a necessity. What do you think of Pamela's Baking & Pancake Mix? As a pancake fanatic, I've got to say this is far better than any wheat based mixes. I use real maple syrup and milk for the batter. Made waffles with this mix and couldn't tell the difference from regular waffles. I used buttermilk instead of water. Next time I'll add a pinch of sugar round out the flavor. I like the vanilla idea. This mix is worth every penny if you have to eat gluten free. I never had pancakes so good!!! I also tried the waffles and muffins - all awesome and better than any white flour recipe. Tried this product, have made cookies with it too - works really well, great for if you have a family member with celiac that can't have gluten. I'm not rating until I try this product, but I've always been a skeptic when buying products that are gluten free. I do have an intolerance to gluten therefore, eat Larabars and other gluten free products. I am definitely going to buy a package of these next time I'm at my local Health Food Center, thanks for the review!